Aden & Anais is a beautiful line of baby and children's clothing and accessories made from muslin fabrics! You can read all about why they believe muslin is the perfect fabric, but to sum it up, it's a finely woven, breathable fabric that can withstand countless washes (a necessity!). We absolutely love it, so if you haven't tried out a muslin product yet... there's no better time than now! Whether you're looking for a few new items for your mini, or if you're searching for the perfect gift for a mom in your life, Aden & Anais' Fall Collection is sure to please them! 1. Sleeping Bag: Their sleeping bags come pre-washed, are made from 100% cotton muslin, and are basically a wearable blanket. You can sleep well knowing there are no loose sheets in your baby's crib and that they are warm and comfortable! 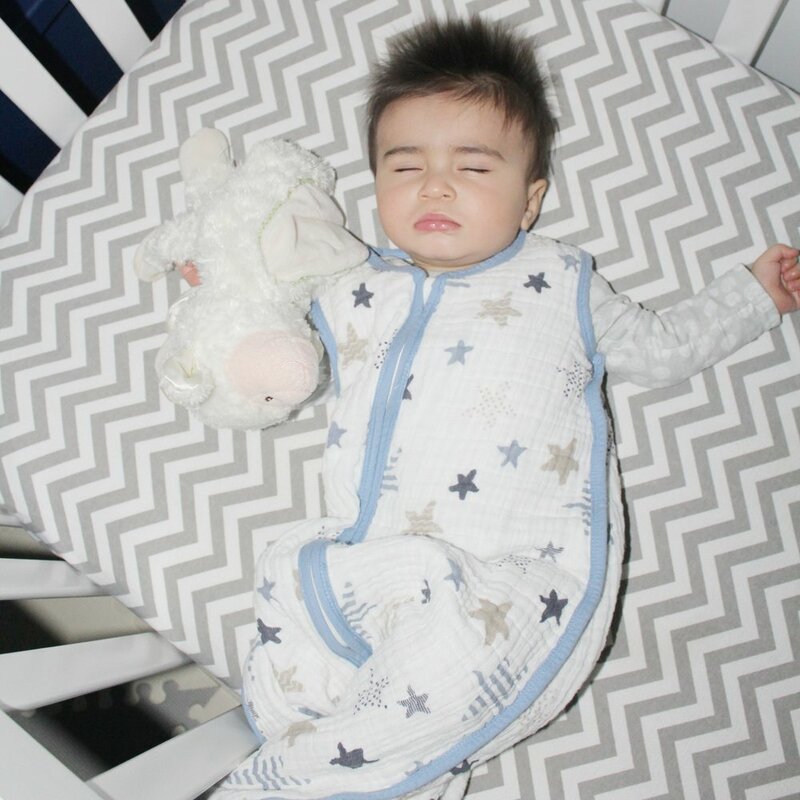 The breathability of muslin cotton means that your baby won't get too hot and will (hopefully) stay asleep longer :). I LOVE that they zip from top to bottom so when you have to do midnight diaper changes you don't need to remove the entire thing! We tried out the: Rockstar Classic Sleeping Bag. 2. Snap Bibs: Babies are messy... and they drool... a lot. Save their clothes and loads of laundry by using absorbent and big bibs! I love the muslin snap bibs from Aden & Anais because they cover Zane's entire chest, come in the nicest patterns and are made with 3 snaps so you can tighten or loosen them to fit your mini perfectly! They're pre washed so they won't shrink, and they're made with 3 layers of muslin cotton... so bring on the drool! :) We tried the Dream Ride 3-Pack Classic Snap Bibs. 3. Coverall: A warm and comfortable baby is a happy baby... and so it's no wonder that this onesie has Zane smiling! Made from 100% cotton muslin, this coverall is not only adorable but also super soft and will last wash after wash (like all of the products I've tried from Aden & Anais!). I love the pattern and the fit... and I think Zane does too! We tried the Moon Dot Long Sleeve Coverall. 4. Dream Blanket: Blankets are ESSENTIAL to a new mom. Whether it's to keep your baby warm when you're out of the house, to practice tummy time on the floor, to lie on at the park, or whether it's to keep warm during a late night snuggle session... a warm, washable and soft blanket is a MUST. The Dream Blanket from Aden & Anais is made with 4 layers of muslin cotton so it's their softest blanket yet! I also love how big it is... Zane and I can both easily cuddle under it! We tried the Dream Ride - Lift Off Classic Dream Blanket. If you're looking for that perfect gift for a special new mom in your life, I totally recommend putting together a gift basket with some of the above products from Aden & Anais. The amazing quality and beautiful patterns won't go unnoticed and she's sure to really appreciate it :).